I know I hardly ever post on here but I read everyone daily. 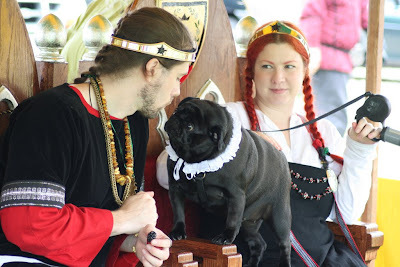 I'm posting today in hopes to get the word further out especially among the pug crowd. 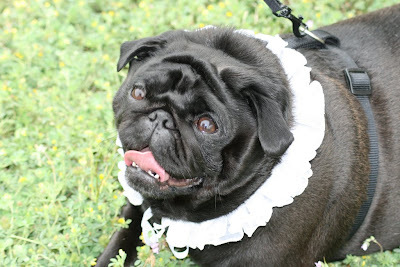 My good friend Janine lost her beloved pug Frodo this past Saturday. She is in Emerald Isle, North Carolina. She's already contacted the vets & shelters (they have a sort of 'Amber Alter' system in their area for animals) as well as the local pug rescue but if you know anything else she should do please let me know. We are praying that someone will take him to the vet this morning and have his microchip scanned. Thought I would share a few more pics right away. 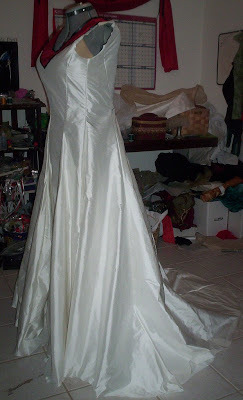 :) I was showing you the progress on my Coronation gown; I got it done just in time. I am really happy with how it came out!! 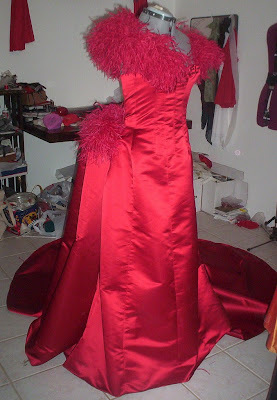 The red gown was REALLY expensive one; the fabric alone was close to $1000! I want one for myself now though. LOL! 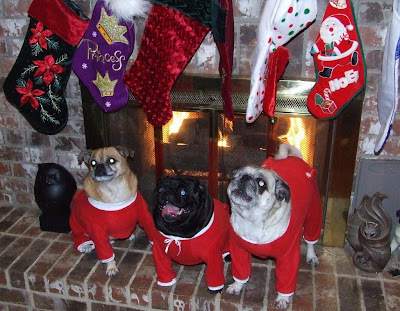 I fail at Blogger - pug in pjs pics to make up for it! Seriously, if you aren't in sugar shock from the cuteness you need to get yourself checked out. 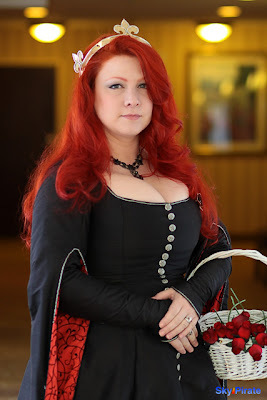 ;) If you don't know Punchy yet here is a link to her blog & here is a link to her Etsy store! I know my furkids are soon going to have a wardrobe from her! I promise to post with some pics & info from this year soon! Trying to get Daddys attention. About to give Daddy a kiss! Its foggy and grey here in DFW this morning and boy, I am wishing I stayed home. 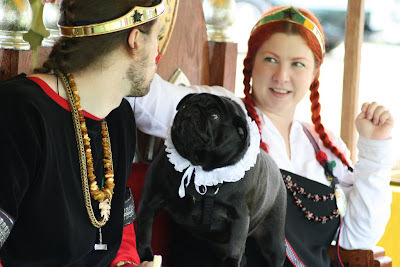 Hubby took a sick day today as he hasn't been feeling 100% the past few days and it took all my willpower not to climb back under the covers and snuggle with him and the pugs for the rest of the day. So now I sit at work WISHING I was at home with my family in bed. At least it is Thursday and almost the weekend, a weekend where I get to stay home, sleep late and basically recharge. 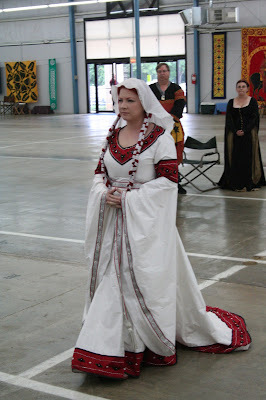 Hubby and I went away to an SCA event in Mississippi last week that was a week long; it is called Gulf Wars and it is wonderful. As we are the Prince and Princess currently we had an awful lot of work to do there but it really was a pleasure. 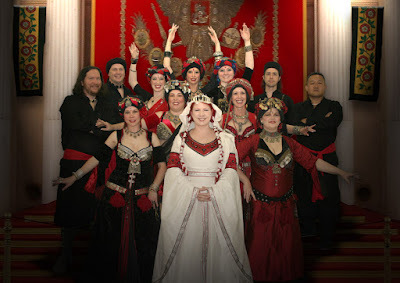 There were about 3,500 people in attendance, everyone dressed in medieval clothes and living like you would in medieval times. Since we are Royalty we got to sleep in a cabin onsite but most people camp. Walking around during the week was nifty, so many of the campsites are gorgeous to look at with period pavillions and streaming silk banners. We had such a wonderful time that week it has been hard this week getting re-adjusted to the real world. I mean, who wouldn't have trouble going back to work and doing mundane things after literally being treated like a Princess for the past week? So I've been kinda sad this week and the rainy weather hasn't been helping my mood much. 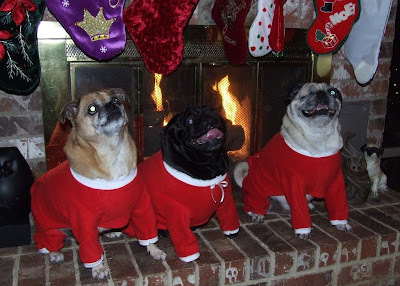 The pugs stayed home for the week and I missed them terribly! I had a dog sitter come feed them in the mornings and our friend K come visit them in the evenings. The house was a mess when we got back; the pugs somehow figured out how to get around the barrier fence we set up around the couches and they were covered in hair and unfortunately pee when we got home. :( They have since been vaccumed and steam cleaned but it is very frustrating to have to go through all that. 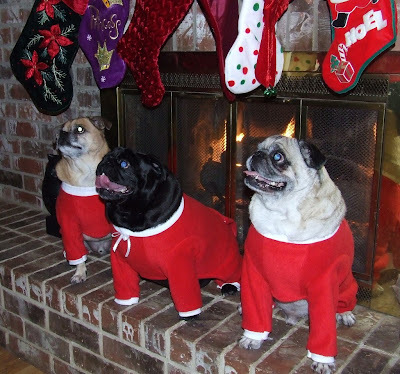 The pugs have a doggie door yet they choose to pee on the furniture. Hubby was seriously upset about the accidents but was better after everything was cleaned. 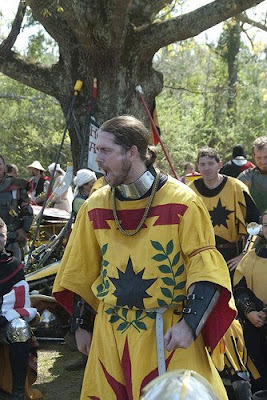 Anyways, here are some pics taken recently of Hubby and I.
Hubby firing up the troops! Still alot to do. 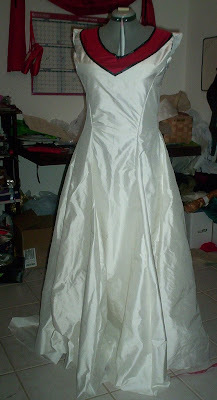 The sleeves are only half there, the bottom half will be large bell sleeves. 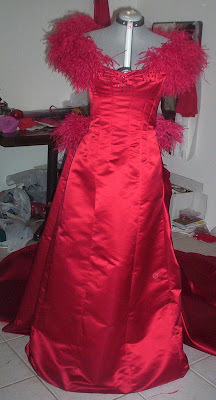 The hem of the sleeves will also be beaded so I can't attach them till that is done and then they are lined. Pics will be posted as I make more progress! Yeap, thats me. :p Sorry I haven't been keeping up with posting over here although I read everyone else's blogs daily. Wouldn't miss them! 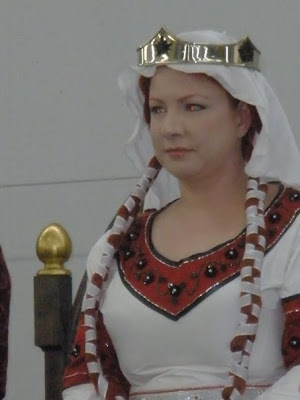 Things have been really busy down here in Texas; only about two months left till Hubby and I step up as King and Queen of our Kingdom in the SCA. Two months might seem like ALOT of time but its not when you are making, hand beading and embroidering two outfits! Side view, you can see the train. 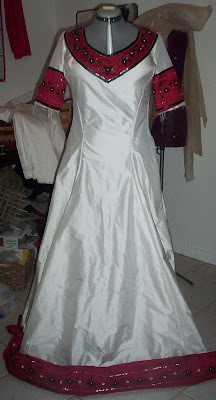 The dress is 8.5 yards around at the hem! 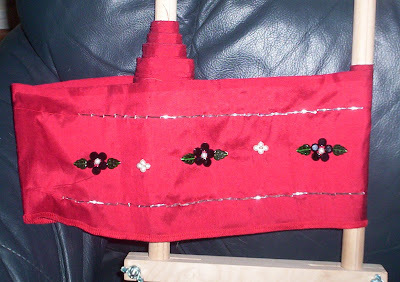 Started the beading for the hem of the dress; the silk is REALLY red rather than pink like my silly camera makes it out to be. 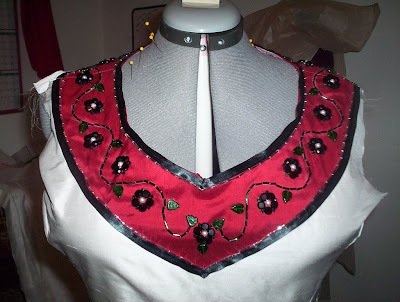 FYI, the beading is not crooked either; its just the way the silk was laying when I took the pic that makes it looks so. 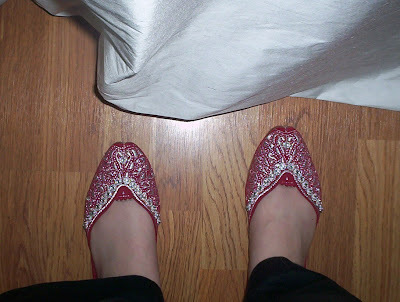 My shoes that I will be wearing on the big day! I love them but they are a little snug so I am wearing them to stretch them out a little. Well thats all for now! I hope everyone out there in Blogger land is well! 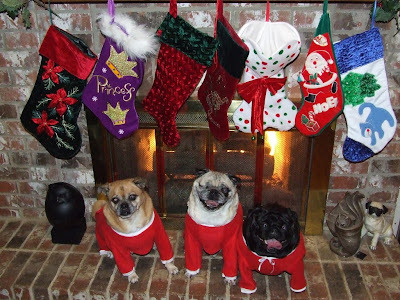 A blog about my life with three little Pugs from Texas! Home of Ickis (part Chihuahua), Tank and Pearl!